Since the terrorists hit Paris on the evening of 13 November 2015, in a series of coordinated attacks—consisting of mass shootings, suicide bombings, and hostage-taking comparisons were made between the Paris attacks and the 2008 Mumbai attacks by analysts worldwide. Michael Leiter, former director of the United States National Counterterrorism Center, said that the attacks demonstrated great sophistication not seen in a city attack since the 2008 Mumbai attacks and that it would change how the West regards the threat. Bruce Riedel, Director of The Intelligence Project at a Washington, DC based public policy organization Brookings Institution claimed the Paris attacks were modeled on Mumbai attacks of 2008. Mumbai has been studied by both terrorists and counter-terrorists because it set a gold standard for how a small group of suicidal fanatics can paralyze a major city, attract global attention, and terrorize a continent. The Paris and Mumbai attacks both used small, well-armed bands of terrorists striking simultaneously and sequentially against multiple soft targets in an urban area. However upon taking a deeper look at the 26/11 Mumbai Attacks of 2008 we find facts still ignored or never taken into consideration by our investigative agencies and many crucial questions still remain unanswered to this day. In that respect, first all aspects of the Mumbai attacks need to be understood thoroughly to be able to draw any conclusive parallel with the Paris attacks in terms of the motive behind the attacks and their perpetrators. The 2008 Mumbai attacks itself were a continuation of a string of attacks in India including the 2006 Mumbai train bombings which was a sequel to the Madrid train bombings in 2004. Fewer security experts within India might be aware and still less number of politicians may have any idea of similar incidents of various magnitudes and similar modus operandi occurring all over the world. Just to give an example two years before Mumbai train blasts there occurred an incident in one of the leading western capitals. As our leaders’ knowledge – both political and bureaucratic, does not go beyond English speaking countries, the closest that anyone in the media came to was that of London bombings a year before in which it has now been proved that the London Police over reacted and killed an innocent and to cover up their inefficiency weaved the story of a terrorist plot. Yet we are happy to equate what happened in India to that of 911, the after math left a trail of destruction that raked in many countries by acts of senseless war and follow up terror which was admitted by President Bush as a mistake and by Condoleezza Rice as a massive intelligence failure. The actual 911 terrorist event is now exposed as an incident, which may not bear any Islamic terrorist origin. The examination of this case along with the current blasts in Mumbai in investigating the reasons will help us in forming a strategy to orient our security agencies in a new direction. For this we have to start with the examination of the first attack on Mumbai – the train blasts. Exactly two years before Mumbai train blasts, on Thursday 11 March 2004, during the morning rush hour between 6.30 AM to 7 AM, 8 – 10 blasts occurred in Madrid, Spain in which exactly 200 people were killed and close to 800 – 1000 injured. Though the western English media pointed the blame at the al Qaeda terrorists or Basque separatists (first it was claimed the perpetrators were members of Euskadi Ta Askatasuna [ETA] which means Basque Homeland and Freedom) it took less than few hours for the Spanish police and European intelligence outfits to detect that the bombing were in fact a false flag operation in the ongoing geo-political tussle between old Europe and Anglican countries to disrupt Spanish tourism at regional level and at a larger political level a warning to the newly elected socialist government not to pull out from Iraqi coalition which was an election promise by the socialist party and to remind them that ‘Islamic terrorism’ still was a threat. We first need to examine the motive in the case of the Spanish tragedy where there is no cross border terrorism as we have in India. Most people continue to ask the same-old question “Why?” And why in Spain? Hours after the Spanish train bombing incident even before the investigative agencies ever started piecing the evidences together, every media outlet taking its lead from the omnipotent New York Times reported that between eight and ten explosive devices had been detonated on board the Spanish trains during the rush hour, but surprisingly not one of them mentioned suicide bombers. This is an impossible omission, because we all know that every car, or bus or plane or train blown up anywhere by ‘Muslim Terrorists’, is invariably attacked by ‘suicide bombers’. How do we know this? Because the New York Times or London Observer always tells us so. No matter whether it is a truck in Baghdad, a bus in Tel Aviv, a car in Moscow or a train in Chechnya, the western media villain of the piece is always the ubiquitous Muslim suicide bomber. As this is absent in this case in Spanish bombing the blame secondly was thrown on ETA. The ever careful Spanish police ruled out both for the following reasons of their own. In order to explore the motive behind Madrid, we need to move back briefly in time to mid-2002, when the Australian Prime Minister, John Howard was finding it difficult to convince Australian citizens to go ‘All the way with the USA’ in the latter’s crusade against Islamic fundamentalism, the so called ‘War on Terror’. Very few Americans might be aware that, two years ago more than 90% of the Australians were opposed to join the coalition forces in their fight against Iraq. A majority of the Aussies pointed out correctly, that although thousands died every year in road traffic accidents and domestic muggings, no one had ever been killed in Australia by a terrorist. Certainly these ‘ordinary’ citizens who said ‘no’ to war needed to understand a lesson that the ‘Muslim terrorists’ were real and all pervasive. By early October 2002, coincidentally, a lesson was ready to learn, when a sophisticated multi-pronged terrorist operation was launched against the Australian tourists in the popular holiday Island of Bali. More than 200 people died and over 1,000 were seriously injured. Do these precise numbers begin to ring any alarm bells somewhere else about the Madrid operation? Or the number of casualties in Mumbai train blasts? Or the number of people died in the recent terror attack in Mumbai? Always it is close to 200 dead and close to 1000 injured? Such coincidences are very strange and indeed mathematically precise. Over the next eighteen months in Spain things got even worse than they had been in Australia. Where 90% of the Australians had opposed military intervention in the Middle East the figure in Spain rose to 96%. Finally the popular current socialist government promptly pulled out from Iraq. For a detailed comparative analysis on the Mumbai – Madrid train bombings refer to our earlier report Globalized Terror In A Liberalized World. Speaking to CNN-IBN regarding the recent attacks in Paris, Mumbai Police Joint Commissioner (Law and Order) Deven Bharti said that “prime facie, the similarity is on the involvement of multiple targets, indiscriminate firing and use of IEDs. “This kind of attack was first carried out in Mumbai and today it has been improvised in Paris,” said Bharti. He added that the modus operandi seems to be similar in both the attacks. Notably, there are several uncanny similarities between Mumbai 26/11 and Paris attacks. In both the cases the perpetrators used assault rifles and bombs. Also, in both the incidents, the terrorists attacked soft targets like restaurants and other crowded places. What we would like to point out here is that the targets of Mumbai Attacks were not merely ‘soft targets’ but ‘strategic targets’, specifically the targets at Taj Hotel as well as the ATS Chief and his team that was assassinated. The attacks on Taj, Oberoi Hotels and Nariman House in Mumbai were peculiar and it is quite possible that the targets at these three establishments were high value individuals and the who’s who of western intelligence agencies. For us to understand our own security needs better, we need to look at the situation through a new prism. The age-old Latin saying “Qui Bono” i.e. “Who benefited from the act?” and the economic trail is what needs to be followed. In case of global terrorism, interspersed with State sponsored terrorism or cases of democratic nations supporting State sponsored terrorism for geo-political gains, the question that needs to be asked is, “Who is benefiting the most?” It will be helpful to take into consideration the long range economic benefits and policy shifts desired by the handlers of these groups and nations, which may provide true insight into the nature of real global terrorism, instead of falling in line with the idea of immediate theoretical emotional benefits for few terrorist outfits. From the very start of the new millennium, the Indian NDA government took a 180-degree turn ditching the Non-Aligned Policy by openly moving into the US-Britain-Israeli camp. After that, the UPA government also appeared to be slowly following the policy NDA started. At a larger geo-political level, the question that we need to ask is: Are the Mumbai bombings like Spanish bombings a warning to the ruling coalition to change the course of either their foreign or domestic policy? So who actually hit the Taj Hotel? Now, if what Ajmal Kasab was saying is true, then out of the ten terrorists who infiltrated India, four were killed and one was captured alive, but what about the five who escaped? Did all militants perish? Or is it correct in saying as many analysts pointed out that there were actually 30 people involved in the attacks? Who precisely carried out these attacks at Taj, Oberoi and Nariman House simultaneously coinciding with the elimination of the ATS Chief Hemant Karkare? The two targets, the ATS Chief and the three buildings that were selected, are diagonally opposite in nature and texture. The former is definitely not in favor of either the underworld or the foreign intelligence agencies that want to penetrate into India using the cover of rightwing militant organizations. The latter mentioned targets, Taj and Oberoi hosted ‘distinguished guests’ during the last week of November 2008. Most of them were coordinators of intelligence in South Asia. Few names that resided there being, former US Secretary of State Henry Kissinger and elite members of President Elect Barack Obama’s Global Economic Team in India attending the “American Foreign Policy After Elections Conference” organized by the Confederation of Indian Industry (CII) and Aspen Institute India in Mumbai. Were these distinguished guests rethinking how to save falling western economies with the aid of India? 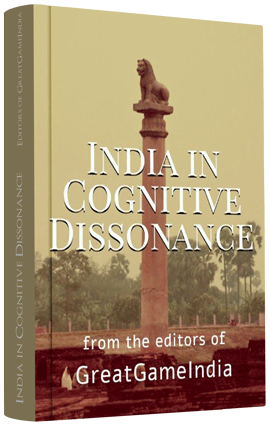 As often, history makes it a habit to repeat itself; in the last 200 years whenever the West was in trouble, the East India Companies (EIC) or subsequent managing partners of EICs plundered India’s human and natural resources for their survival. In this ‘Great Game’ they kept other geo-political players at bay. Since more than the last decade, under UPA and NDA administrations, Indian foreign policy and domestic economic policy is veering dangerously closer to US-British-Israeli economic interests, viewed by other geo-political players as an encroachment. Did other geo-political players view this meeting as a penetration of their turf? 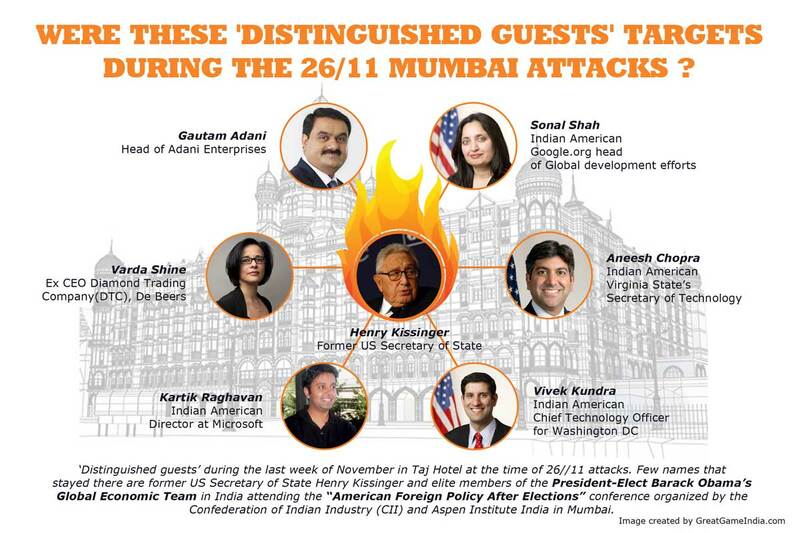 For a more in-depth understanding refer to our report 26/11 Mumbai Attacks – A High Profile Meet & An Assassination. The area of intelligence, counter-intelligence and the protection of national economic resources is not a game for all. India is just waking up to it whereas the west and other geo-political players are veterans. It is a game played by the rules of these veteran players and we cannot define them, but have to understand and play by them. “The Art of War” written by TsunZu, which is considered to be the bible of strategy by many says “Expect what your enemy wants you to do and do exactly the opposite to win the war”. The quote sounds deceptively simple but has far reaching implications on the survival of empires and governments. In that light it would be unwise to yield to the enemy trap be it the recent Paris Attacks or Mumbai Attacks of 2008. As is the case with many of the terrorist groups, they are controlled not only by the states that sponsor terrorism but by the nations that sponsor the states that sponsor such terrorism too. So though all evidence eventually leads to the North Western frontier of India, to learn who instigates these groups, their actions, their modus operandi and their previous track record would guide us in doing what we as a third world neutral sovereign country should do. We hope to make a beginning in this new direction.